- Publisher Welcome to the world of Nicholas: a completely normal kid who happens to find himself in some not-so-normal situations. Fortunately, Nicholas and his best friend, McGee, always seem to learn a valuable lesson from their wild adventures. Volume 4 includes "In the Nick of Time, The Blunder Years, " and "Beauty in the Least." Volume 4includes In the Nick of Time, The Blunder Years,and Beauty in the Least. 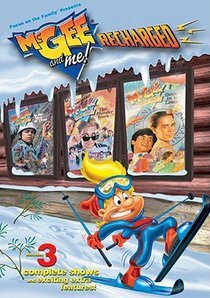 About "Collection #04 (#04 in Mcgee & Me Series)"
Welcome to the world of Nicholas: a completely normal kid who happens to find himself in some not-so-normal situations. Fortunately, Nicholas and his best friend, McGee, always seem to learn a valuable lesson from their wild adventures.